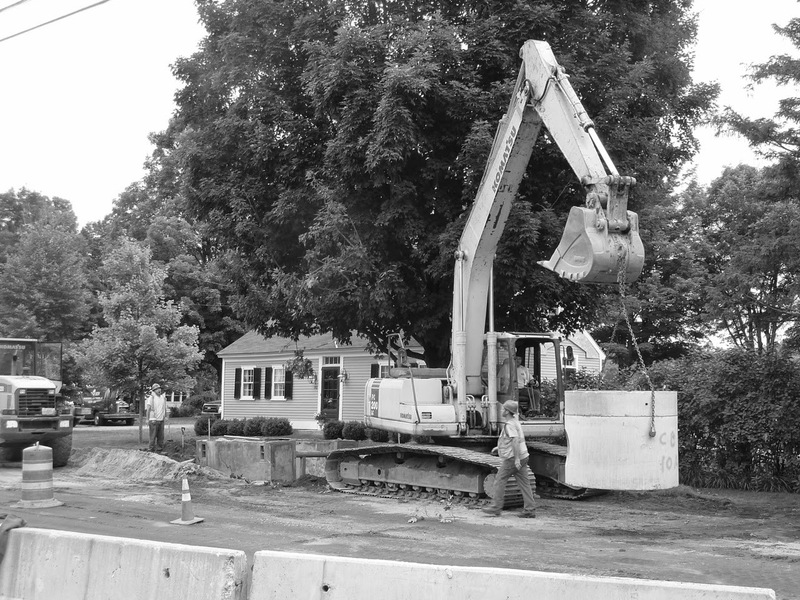 Maybe 100 years from now someone will find these photos and marvel at the "antique" construction equipment used to build roads. 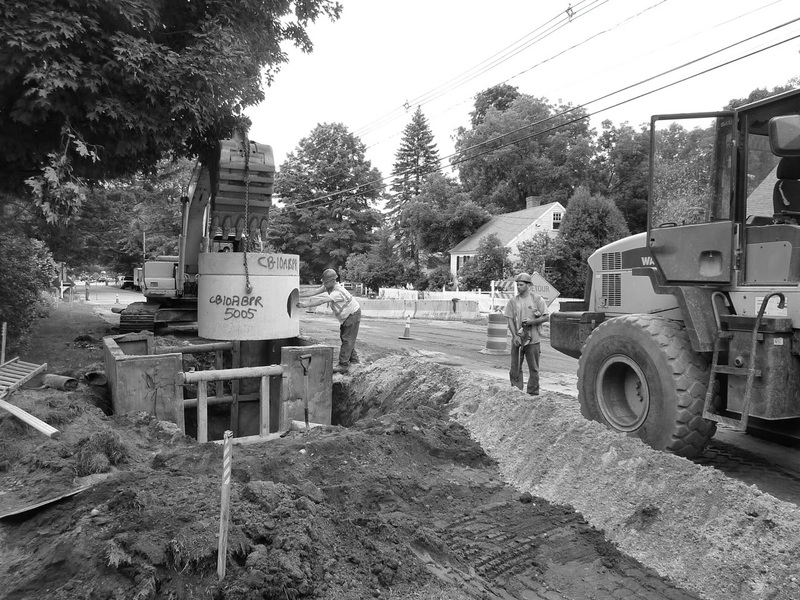 In the meantime, I thought members might like to see what's happening on Boston Post Road between Foundry Street and Sunset Road during the summer of 2014. I'm updating this post frequently as the project moves forward. 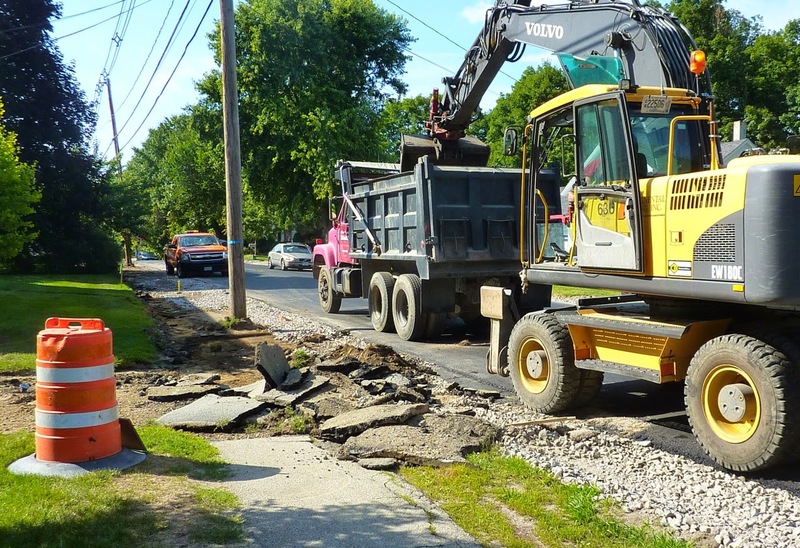 The pavement has long since been removed and they're installing storm drains today (7/29/14) to address standing water issues on the road, on the sidewalk and at the entrance to many driveways. The barriers here prevent south bound traffic from proceeding on BPR towards Mike's Auto and Main St and Carriage Road. 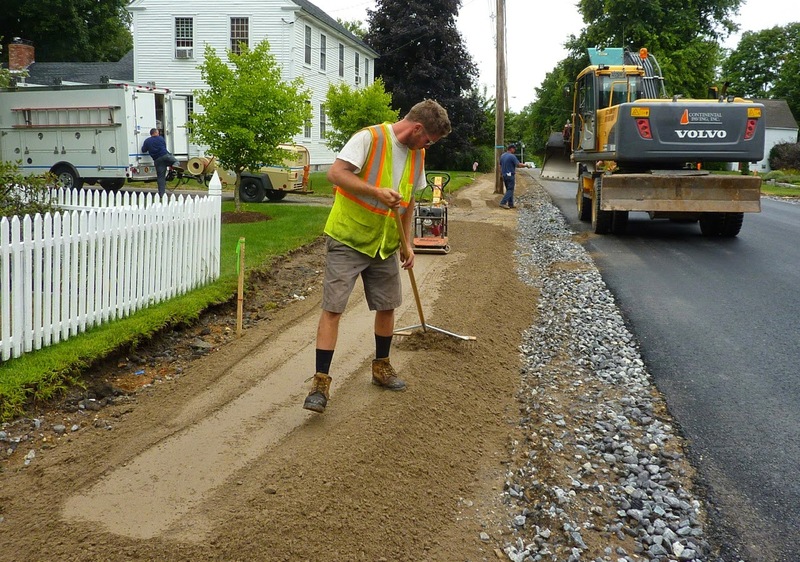 This two month project replaces Pennichuck water lines and rebuilds the road and sidewalk with a stone, rather than a sand bed. Years from now residents may wonder what function all those ugly, overhead wires served! I think that at one time we called these units "catch basins" but today they're reffered to as storm drains. The large, round granite "wheel" in the Wigwam Garden, used to shape the steel rims of wagon wheels came from the front yard of this property at 92 BPR. A picture of that stone is available in the following blogpost. The sidewalk as well, on the west side of BPR will be removed and replaced. Director of Public Works, Bruce Berry, updates residents every Friday via email to address concerns, advise of progress and soothe nerves. His proactive, get out in front of problems attitude is very much appreciated by abutters. 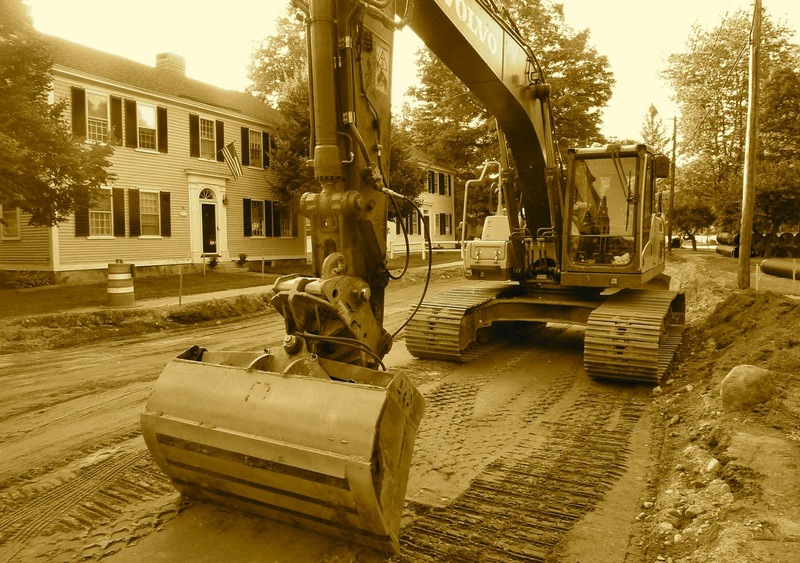 There's a lot of heavy equipment that creates noise and vibration. 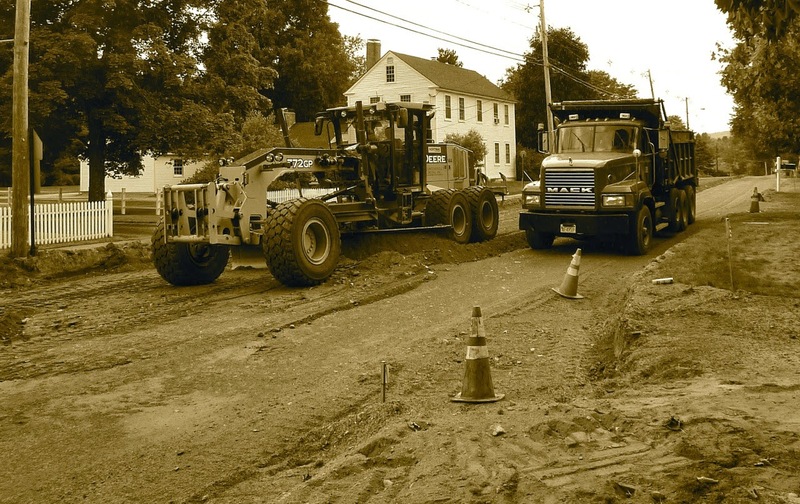 The two major contractors, CSSI of Merrimack and Continental Paving from Londonderry, strategically place seismic recorders to monitor vibration and identify areas of danger to private property. Before the project started, homeowners had the option to have their interiors video taped to address damage concerns when the project is complete. 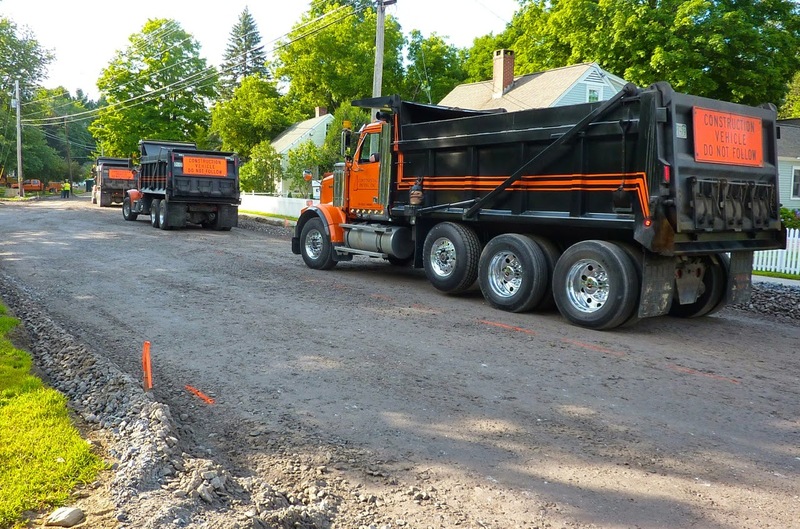 This project stretches from Amherst Street by the Texaco station, to just south of Wilkins School and is slated to be completed before school opens on 2 September. To accomplish this, crews are working 12-hour days from 7 am to 7 pm. It's very disruptive, but those working on the project are extremely aware of this and bend over backwards to accommodate homeowners. In fact, I observed the owner of CSSI helping a resident moving heavy furniture into his home. He saw someone struggling and jumped in to help. Yes... I helped too! 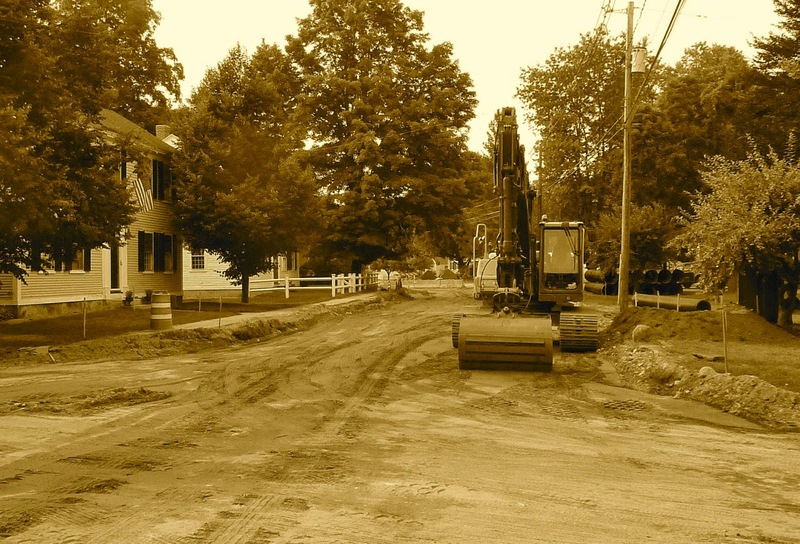 Construction will resume next summer as work will commence on Foundry Street. Here's what BPR looked like in the very late 1800's when it was known as "The Mont Vernon Road." The house just beyond the "horse & buggy" was the local blacksmith shop and is the grey cape in the pictures above. This is the section of BPR between Sunset and Middle Street. The chapel museum can be seen just ahead and a little to the right. The same view as above and below, taken 8/6/14. 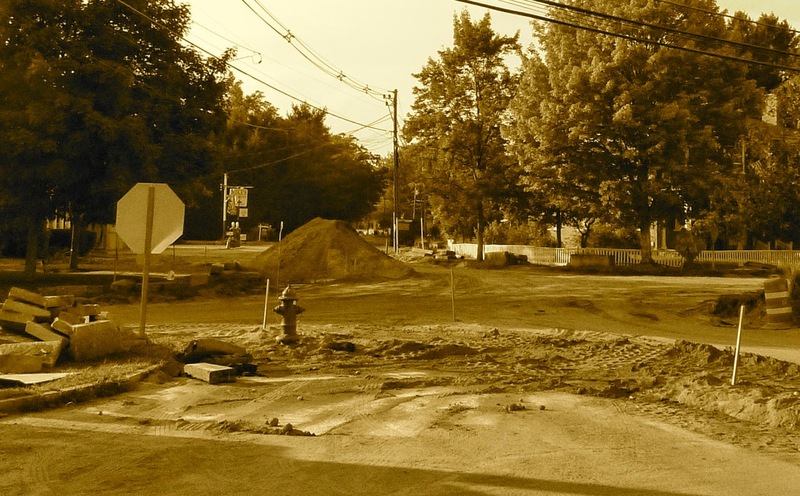 According to a survey by the Nashua Regional Planning Commission taken over a one week period in October 2013, this section of BPR see's 6,000 vehicles per day since the bridge on Manchester Road has been disabled. That means from midnight to midnight in both directions. Current construction has decreased that number somewhat while commuters have sought alternatives. A colorized postcard of the same scene as the picture above. The caption advises that the view is to the east. 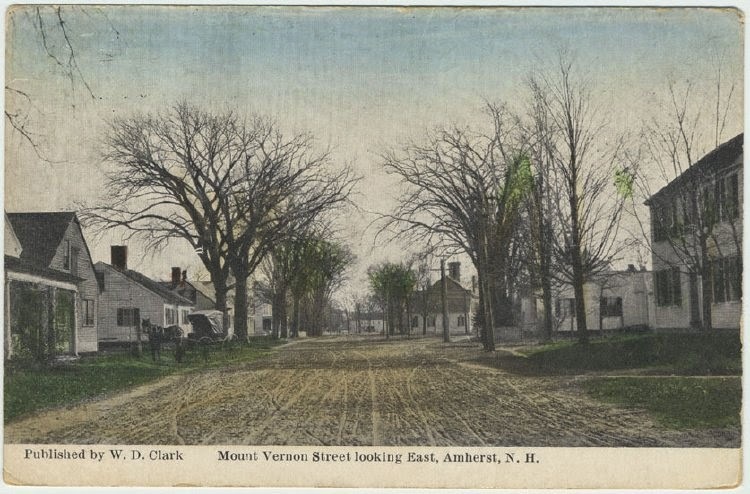 Actually it's to the south and refers to present day BPR as "Mont Vernon Street." 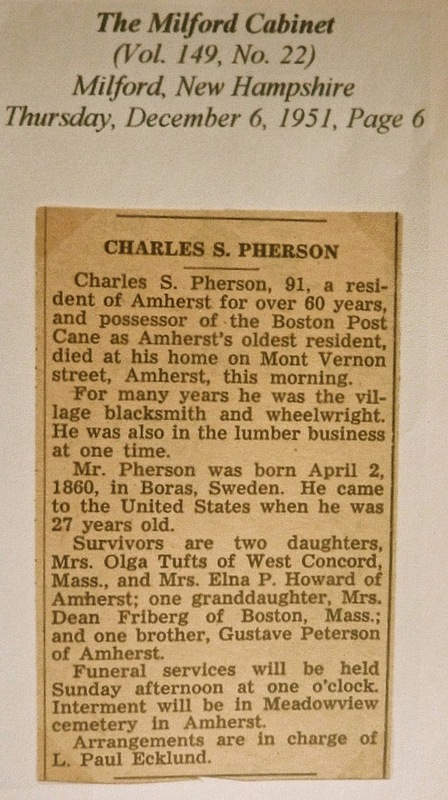 Charles "Tink" Pherson, the towns last blacksmith lived in the house just beyond the horse & buggy and his 1951 Milford Cabinet obituary, indicates his home address as "Mont Vernon Street." 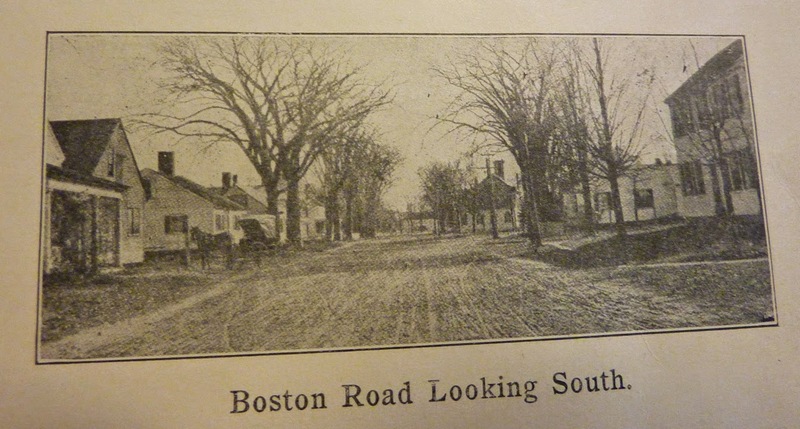 I'm unsure of the origen of the name Boston Post Road and am eager to hear from someone who can clear this up. 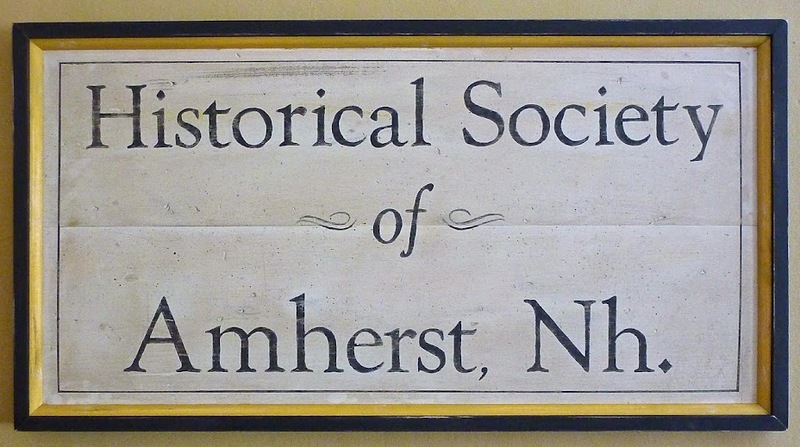 Further research reveals that this road was the southern terminus of the "Second New Hampshire Turnpike," charted in 1799 that stretched from Amherst to Claremont. Charles "Tink" Pherson's obituary. His obit refers to "the Boston Cane." 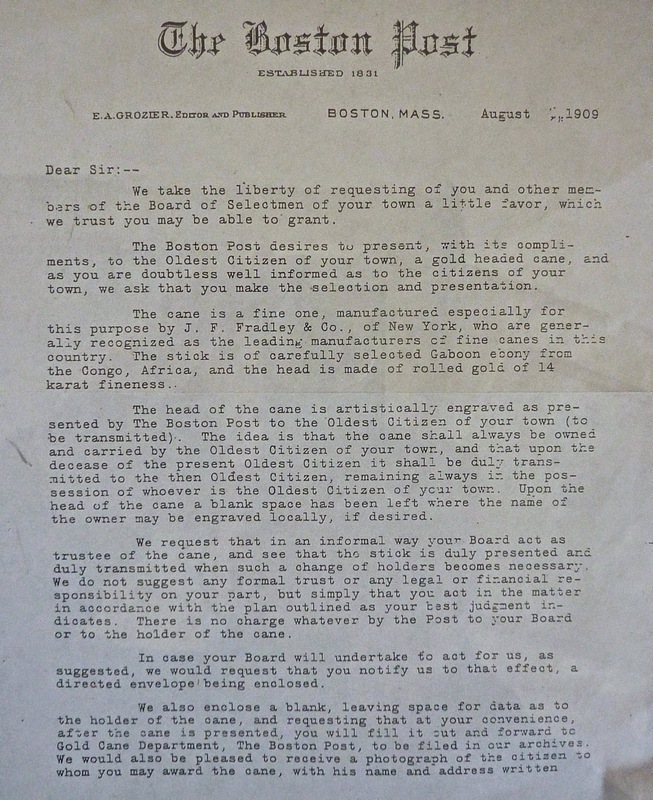 Here's detailed information concerning the Boston Cane. 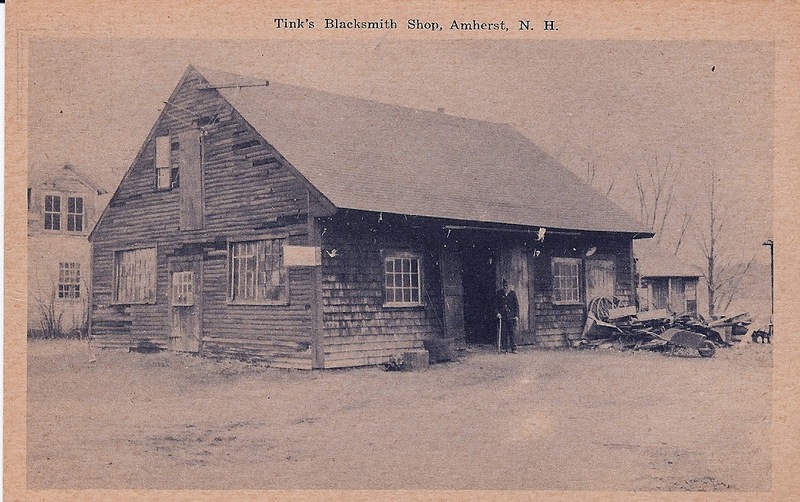 Tink standing at the entrance to his blacksmith shop at 92 BPR. This building was razed in September 1972. Oliver Merrill wrapped a cable around it and "drug her down." This is the site where Tinks blacksmith shop stood for more than 100 years. 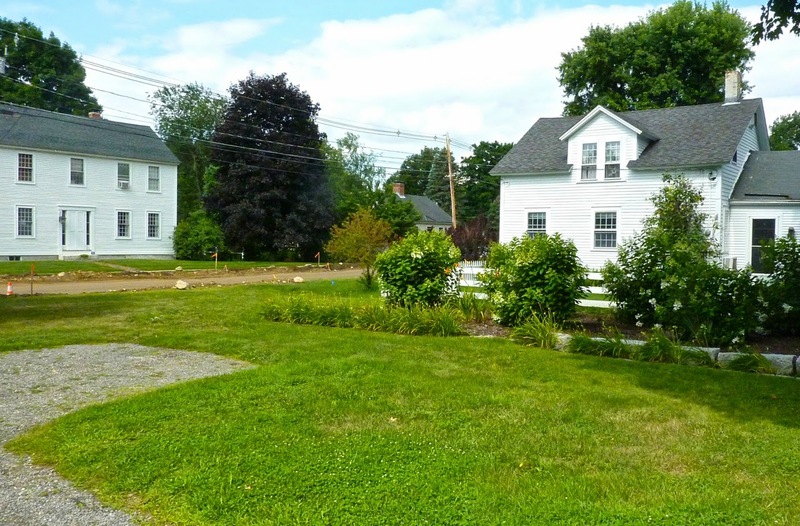 From the previous photo you can see the peaked dormers that still exist on the neighboring property and the Samuel Vose House (c1840) across the street. Before we leave, let me add a few new pictures from 8/4/14 taken from where Middle Street intercepts BPR to Foundry Street, just west of the Flat Iron. The Andrew Wallace House (1825) is to the left and the Wakefield Sisters House (1824) is on the right. Looking north on BPR at the intersection of Foundry and Church by the Andrew Wallace House. The Captain Dana Schoolhouse (pre 1850) and Samuel Vose House (c1840) to the far right. You're standing at the intersection of BPR and Middle Street at the north end of the Flatiron. Standing by Moultons Market (Cushings Folly) looking north on BPR towards Mike's Auto. 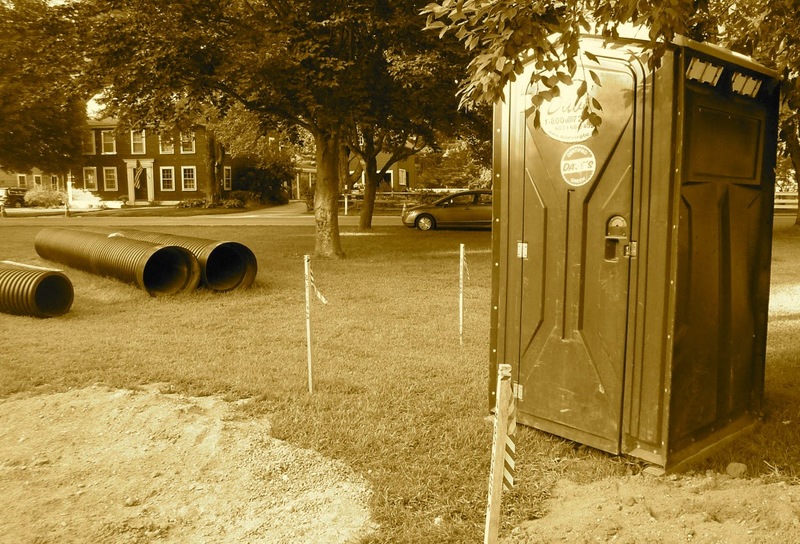 And last, but certainly not least... did you ever think you'd see a "Porta Potty" in the village? It's located in front of the Andrew Wallace House, on the Flat Iron on BPR. 8/11/14. We're entering the home stretch as the grader has been brought out and a stone/gravel mix is being applied and smoothed. 8/12/14. The stone bed is being dumped and spread. Then smoothed. 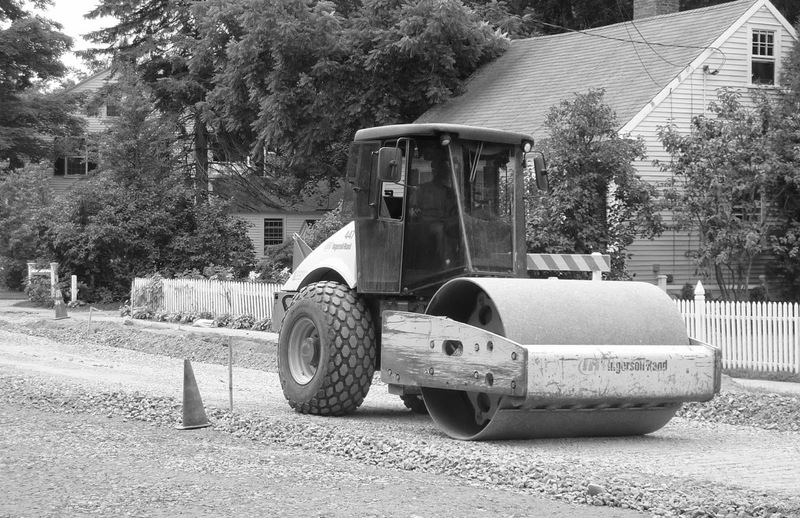 This roller smooths and compacts with weight and vibration. Vibration is set by a frequency and ground movement is monitored with a seismograph and adjusted to minimize possible damage to surrounding structures. 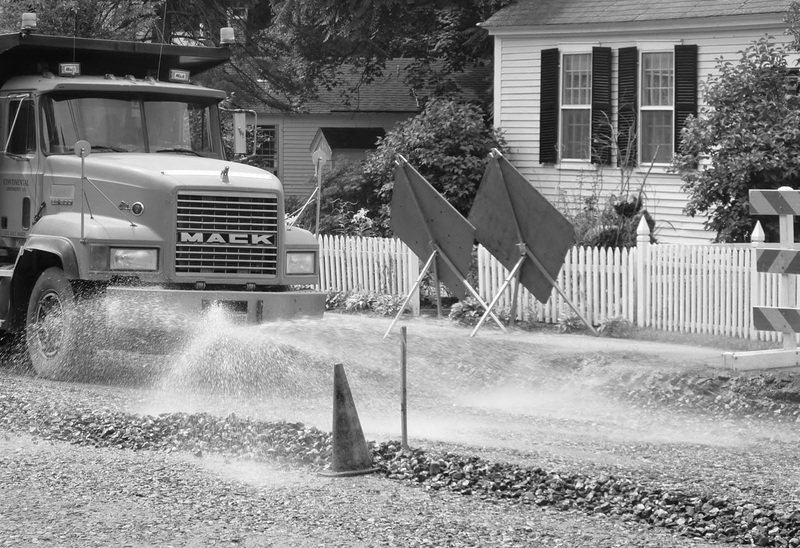 For dust control Continental Paving makes frequent passes with its water wagon. Before each weekend they salt (calcium chloride) the road as well to extend the dampness effect on the road. 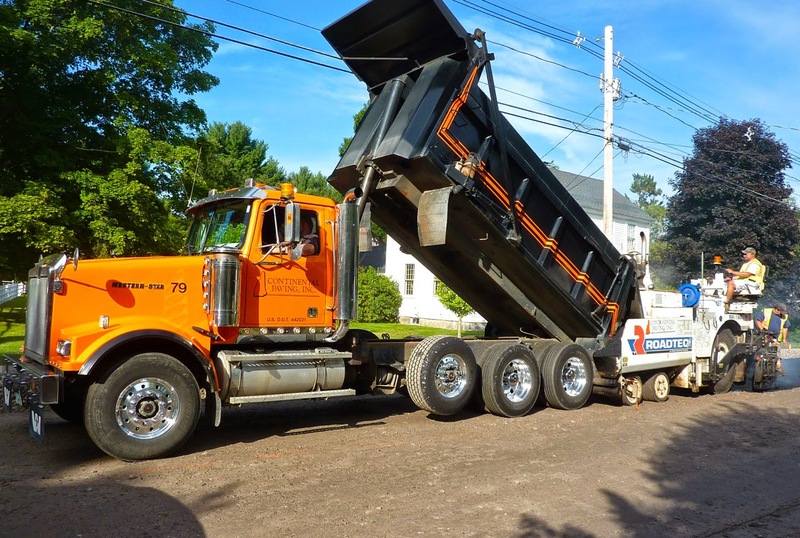 At 7 a.m. trucks full of asphalt assembled on BPR between Sunset and Foundry in preparation to pave our newly constructed road. Something that I notice about businesses is how clean or well maintained they keep their vehicles. Continental Paving in this case does it well. 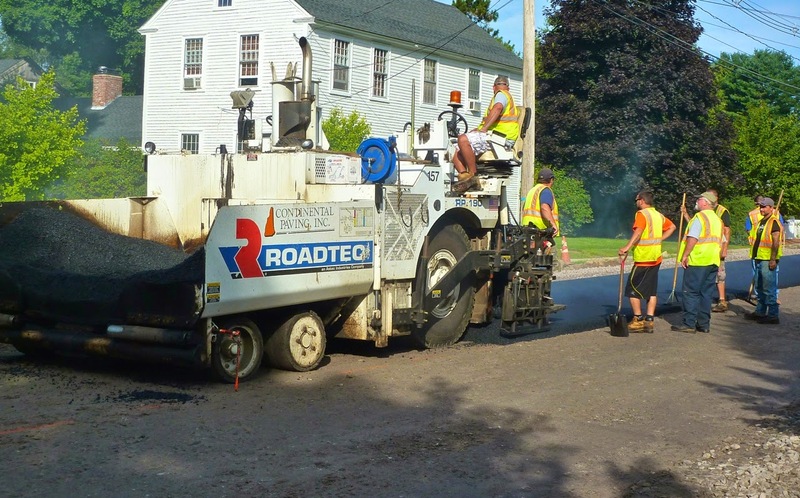 The function of those vehicles shown above is to feed the "wheeled asphalt paver" shown here laying out a thin ribbon of hot material. This machine, a Roadtec RP190, was was built in Chattanooga. The roller, a non-vibrating type, following closely behind. This was a highly choreographed, assembly line type operation that just kept moving forward. "I love the smell of hot asphalt in the morning." Smoothing it out. Five minutes after rolling and smoothing its cooled enough to drive on. Above/below. This is the first application of "base coat." Later this afternoon they'll apply another layer of base coat, each about two and a half inches thick that will compact down to two inches. 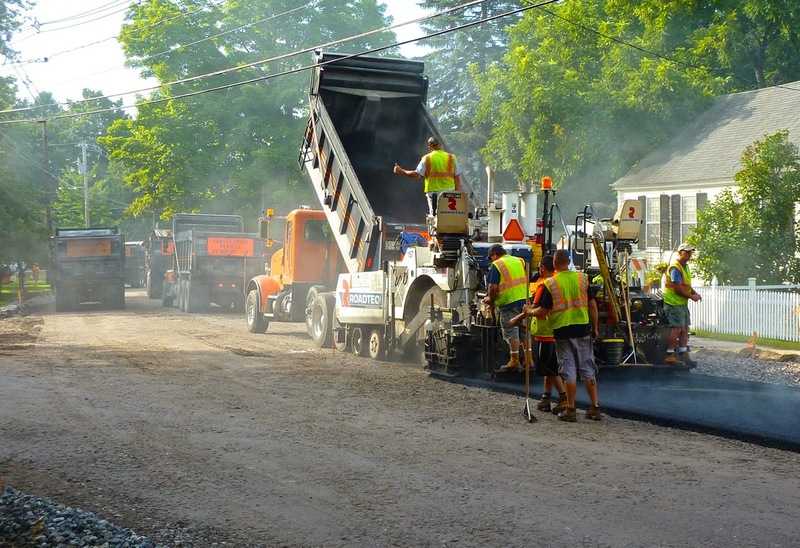 A year from now they'll inspect the road, repair anything that needs attention and then apply the top or final coat. 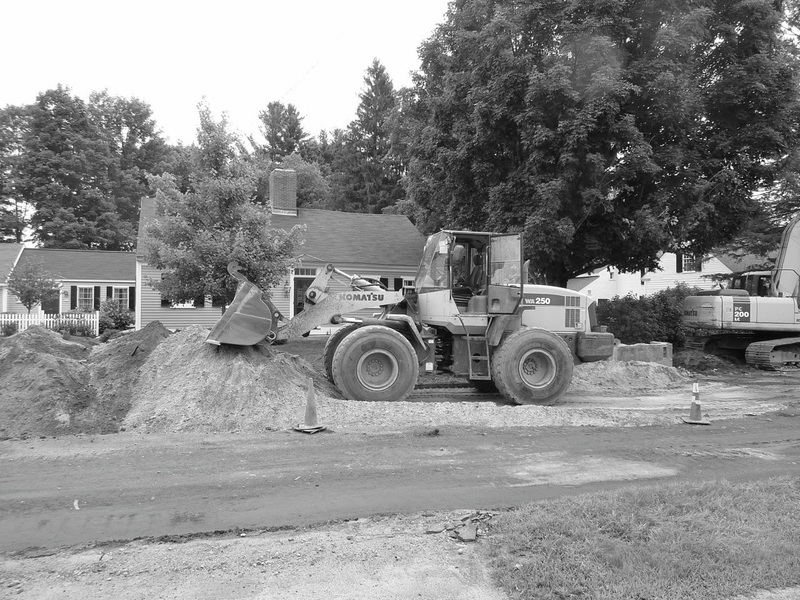 Beneath this asphalt are the new Pennichuck Water lines and a new road drainage system that will direct all water collected from the road to a central point installed beneath Cross Street. 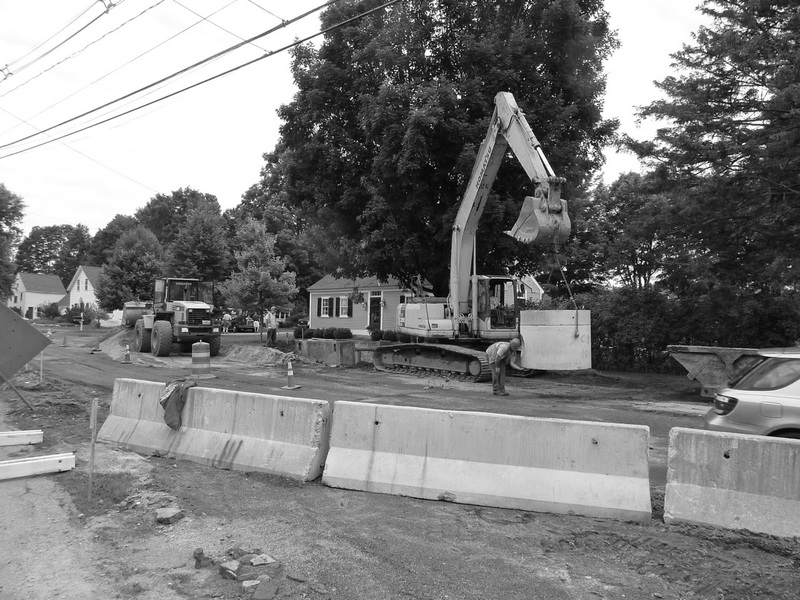 While this project has unfolded, workers have been dealing with vehicular traffic, magnified by the bridge closure on Manchester Road. 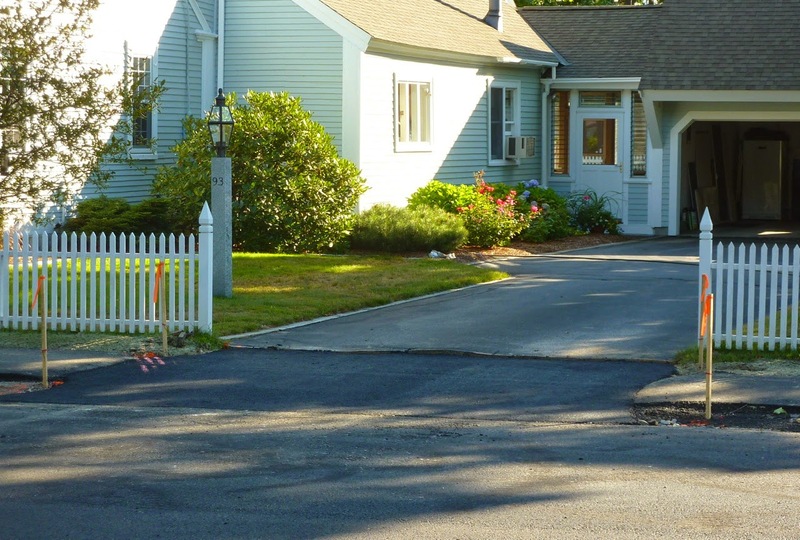 Karen, seen here, and her colleagues have done a wonderful job controlling traffic flow, maintaining safety, accommodating homeowners access to/from their driveways and the occasional, flustered, impatient driver who the rules don't apply to. 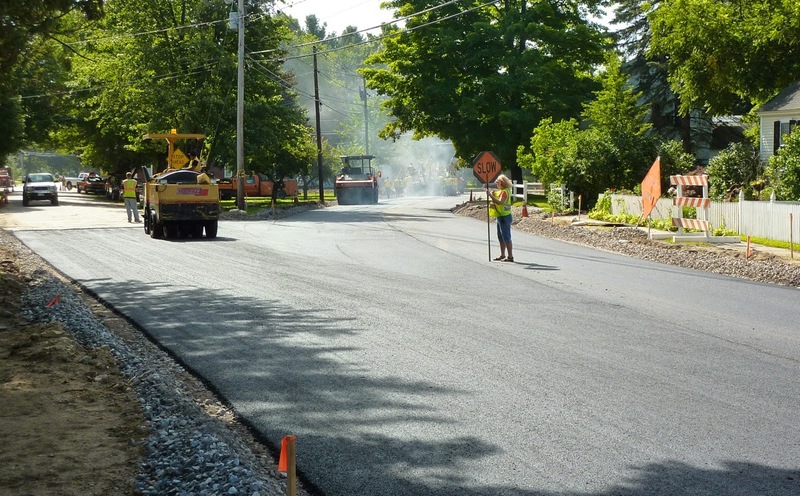 Next week paving will continue on BPR by Moultons Market. I'm unsure about Cross St where I think more digging is in store. 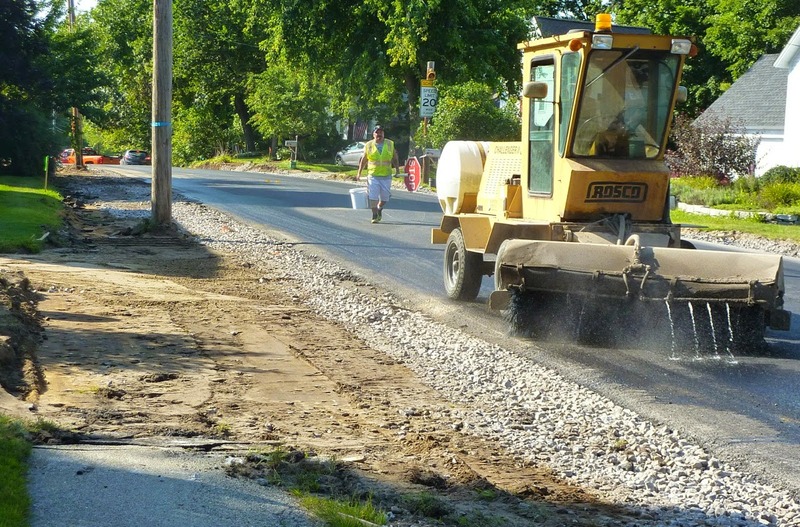 Then Continental will remove the excess stone from the side of the road, tie in all the driveways and remove and replace the sidewalk on the west side of BPR. Then sometime after that a clean up crew arrives to loam, grade and hydro-seed everyones property where it meets the road. 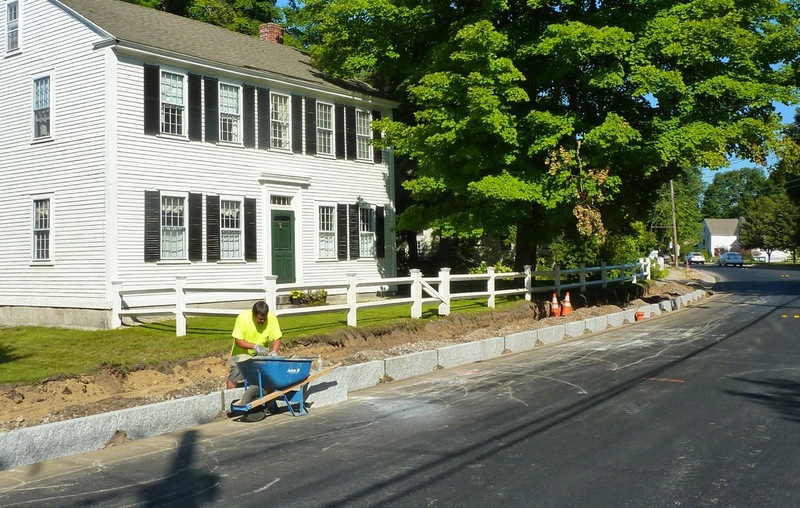 Sidewalk work commenced this morning as the old, well worn structure was removed and granite curbing is put in place in front of The Wakefield Sisters House (1824) at 97 Boston Post Rd. 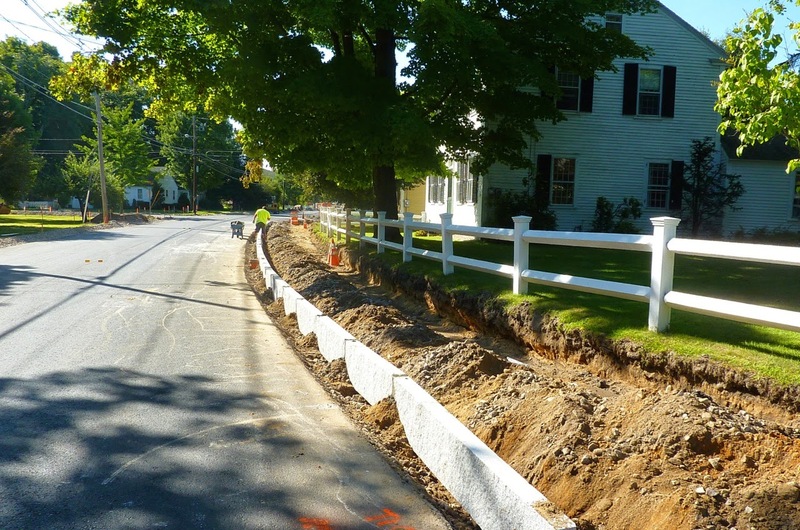 Tri-State Curb from Weare, NH is handling this aspect of the construction. 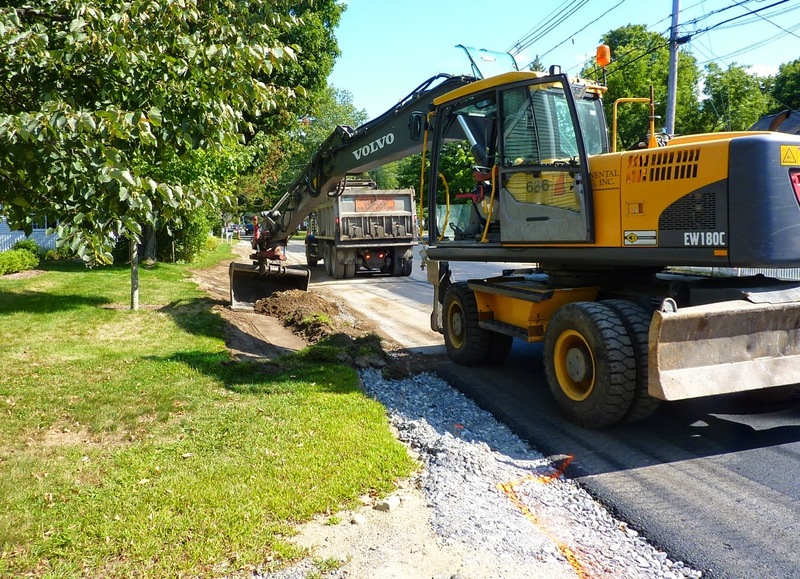 Later in the afternoon, crews relocated north towards 91 BPR to remove the sidewalk and prepare the site for a new surface. This area will have asphalt and a grass strip but no granite curbing. Time to call it a day as the clean up crew sweeps in and neatens the roadside. 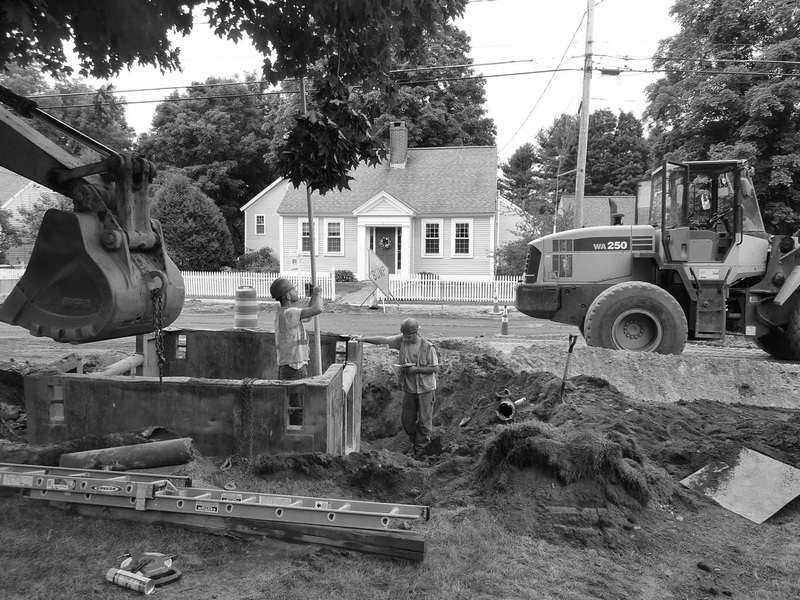 Soon this sidewalk and driveway entrances will be puddle free. 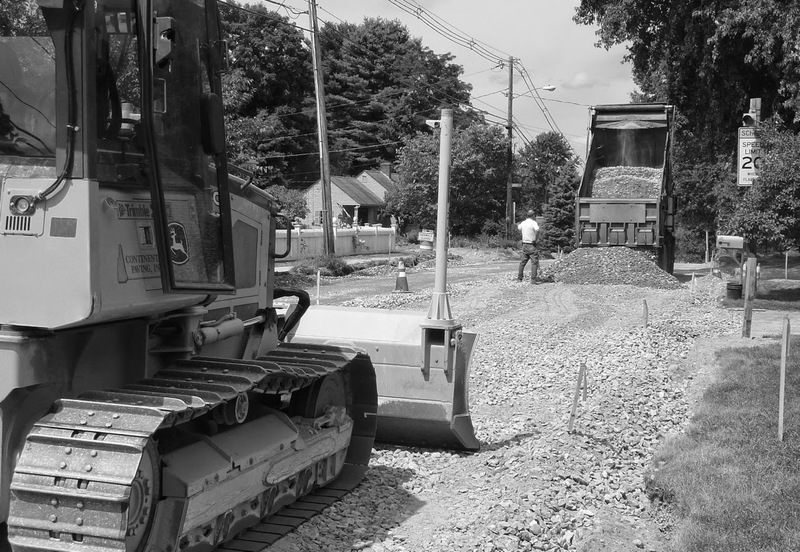 Friday, 8/22: The sidewalk site work is nearly complete with a new gravel bed. The previous sidewalk was uneven, badly broken up and supported many, many puddles which most boys on their way to school seemed to enjoy. 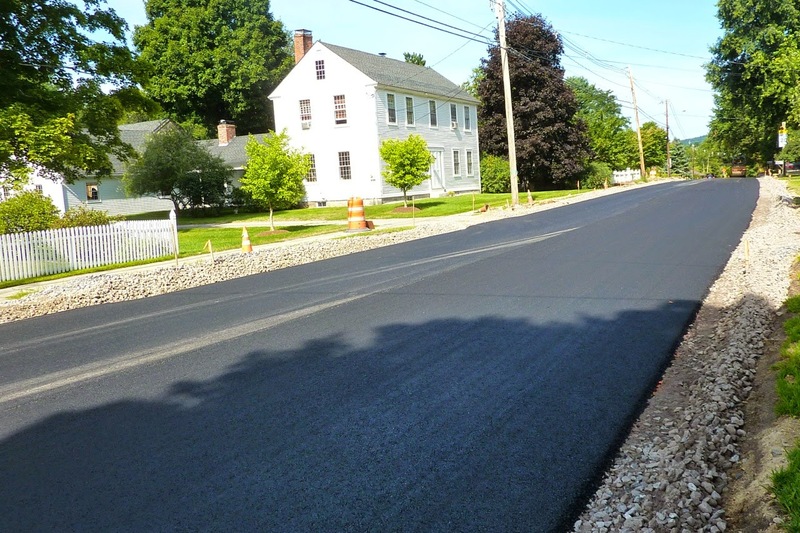 Thursday, 8/28: Continental Paving laying out fresh asphalt along the sidewalks on BPR between Sunset and Middle Street. 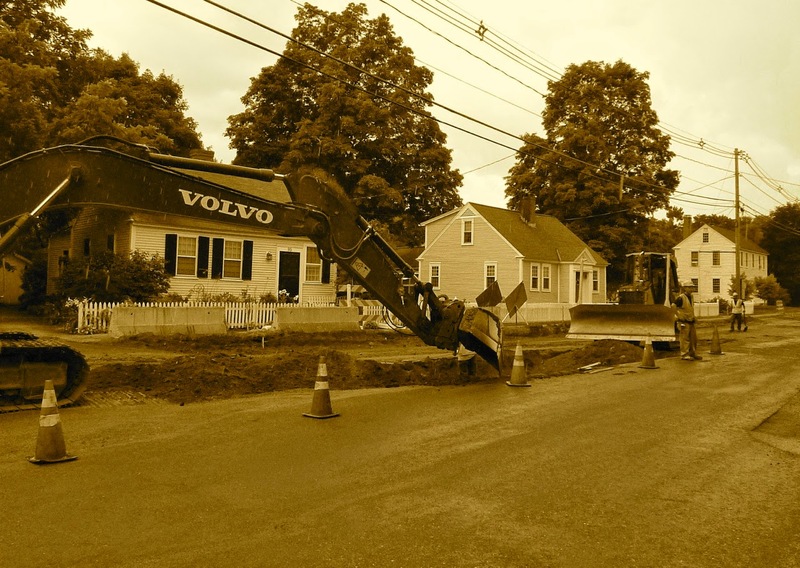 A few catch basins need to be tied in as well as driveways reattached to the road but work is winding down as we approach Labor Day weekend. 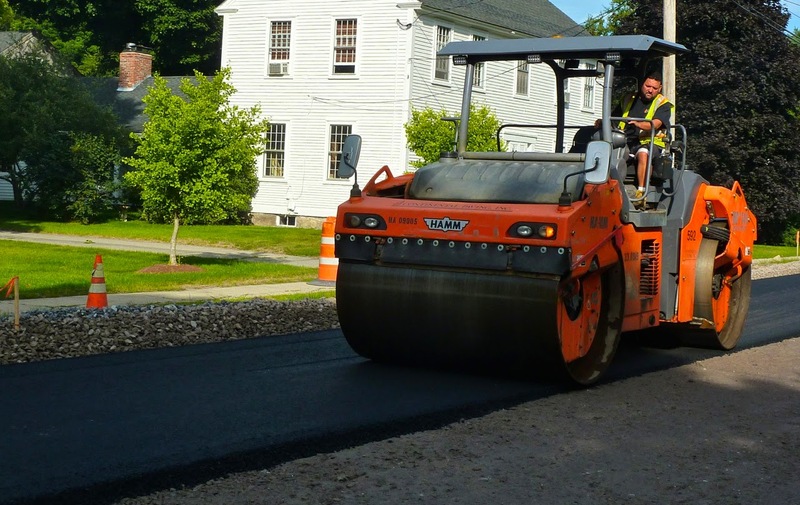 What is asphalt? 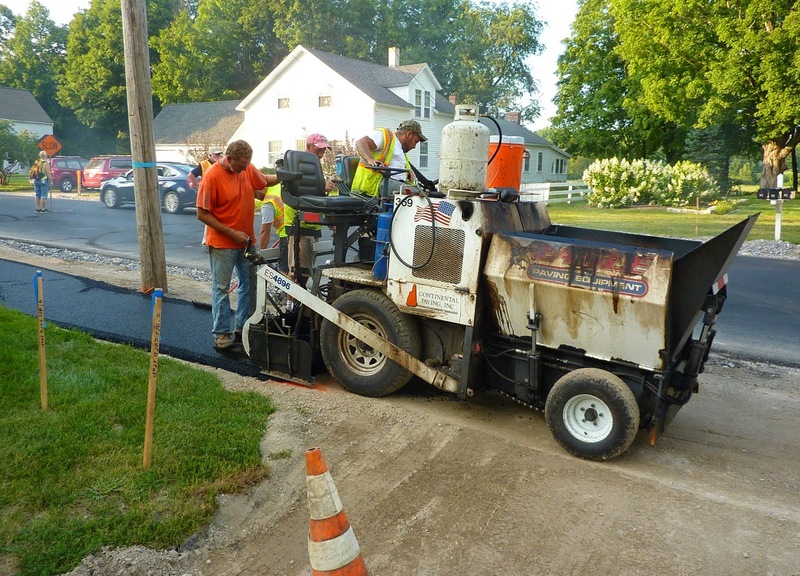 Asphalt is a thick brownish or black substance derived from the same crude oil which produces kerosene, gasoline and vinyl. It is literally scraped from the bottom of the barrel after all other petroleum-based products have been refined or processed. This substance is at least 80% carbon, which explains its deep black color. 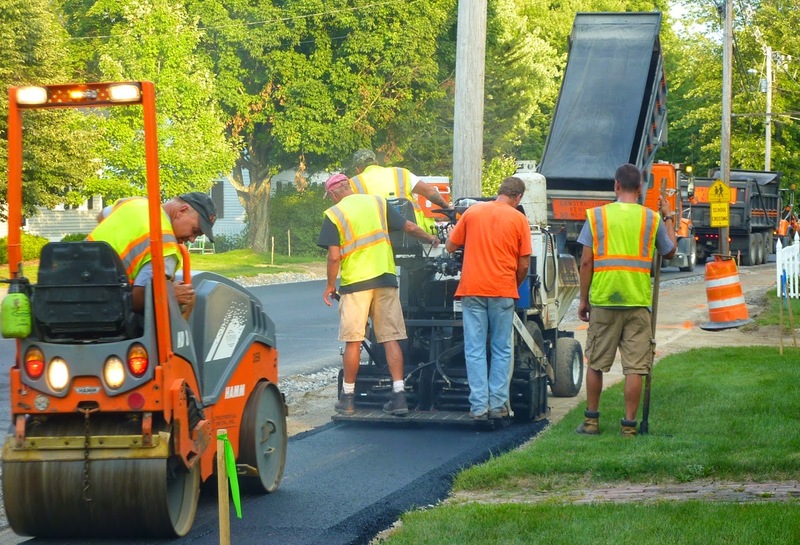 Sulfur is another ingredient found in the tar-likeasphalt, as well as some trace minerals. It is primarily used as a sealant for rooftops and a durable surface for roads, airport runways, playgrounds and parking lots. 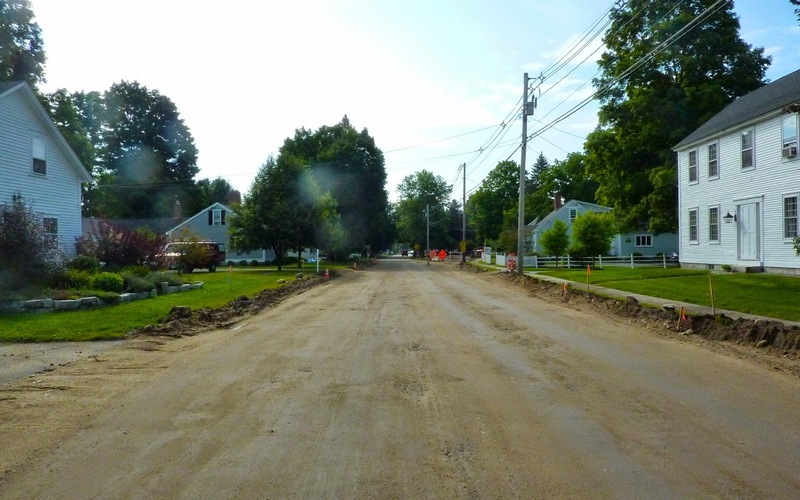 Friday, 8/29: Preparing homeowners property for loam and hydro seeding into the new road surface. 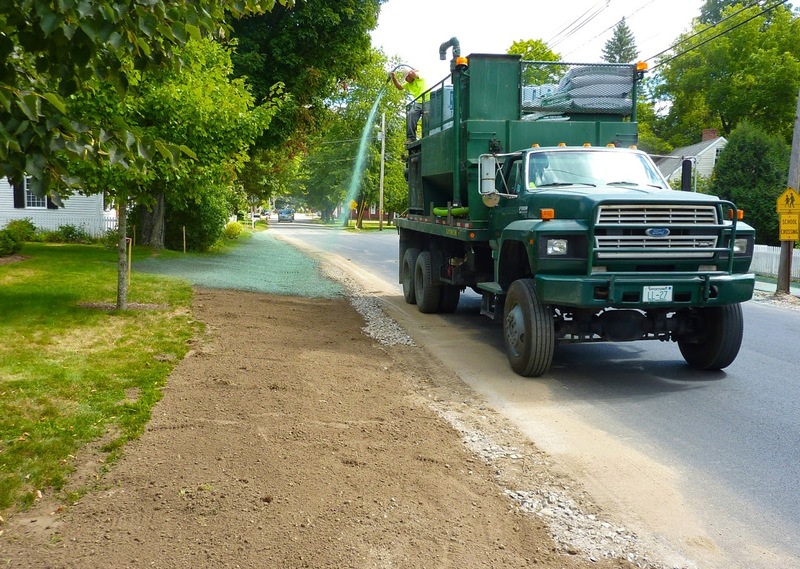 And later, Friday afternoon, Lynch Landscaping from Nashua came through and hydroseeded the edge of homeowners property. Wednesday, 9/3: Continental Paving tied in the driveways and connected the sidewalks. There's more to be done near Moultons but this photo will close out my following of this project. 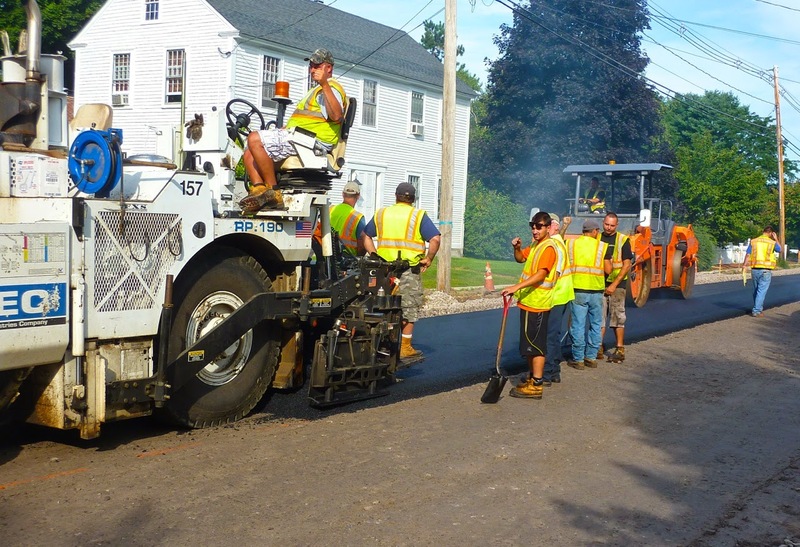 Needless to say it made for a noisy, disruptive summer but the people who work for CSSI, Continental Paving and other contractors couldn't have been more polite, courteous and determined to disrupt our lives as little as possible. Bruce Berry as well did a great job keeping abutters informed and up to date. All in all, not a bad experience for such a large project.